..... I guess I was kind of a Thermaltake fanboy in the mid 2000's LOL. My first performance build in '03 used the Thermaltake Volcano 12 heatsink. Manual speed control knob. It was the hot item on newegg at the time. When booting up BF1942 on a 45% overclock, it was a howling hairdryer!! 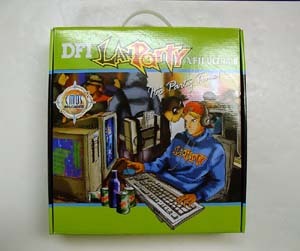 Speaking of Lan Parties...Not sure if you've seen one lately, but I used a DFI Lanparty NF-II ultra-b (can they get any more unnecessary in naming things?) board for a couple years. So an event like that was so popular it creeped into advertising. Like "gaming" is today. The box for it even had a hoodie sweater guy. Complete with blurred cans of mountain dew and a can of Bawlz. Because if I wanted any image to promote what I would become if I used a product, that's exactly what I wanted to be! An over caffeinated dude with bad posture and a beige desktop! yessssss.